Two graduations, a wedding, a family reunion, visits with extended family, and a funeral, sprinkled in between doctor appointments for all family members and added on top of a summer work schedule and preparing our daughters to go away in August for their masters and bachelors programs, has left no time for vacation during our summer. So, we have been making the most of little pockets of time – playing family board games when we can, doing an Escape the Room adventure, getting massages, taking an afternoon walk. 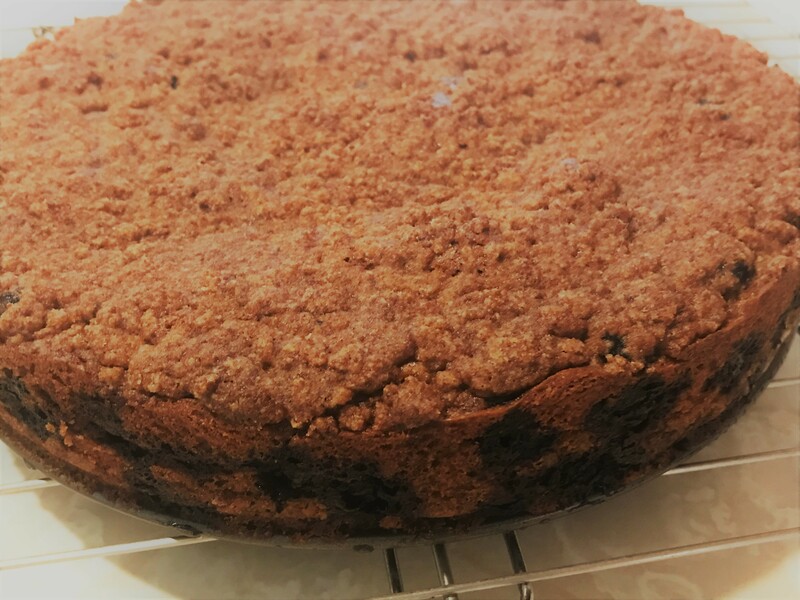 This week, we took time to bake together, making the most of prime blueberry and peach season, and one of the items we made was a blueberry buckle. For folks not familiar, blueberry buckle is similar to a coffee cake but the ratios of fruit to batter are flipped. In coffee cakes, the cake is the star with fruit lending flavor. In a buckle, the fruit is in abundance and the batter is scant, just enough to suspend the fruit. Both have signature crumb toppings. I wanted to make a blueberry buckle which was gluten and dairy free and which didn’t use white refined sugar. It turned out to be quite easy. I simply substituted a store bought gluten free flour blend for the flour, used half the amount of coconut sugar for the regular sugar, and creamed vegan butter instead of regular butter. The result was quite tasty when we had it for dessert with nondairy vanilla ice cream. Line a 9 inch springform pan with parchment paper and preheat the oven to 350 degrees. Mix together the topping flour, coconut sugar, and cinnamon. Using clean hands, squeeze the vegan butter into the dry ingredients until you have thick crumbs. Set aside. Mix together the batter flour, salt, cinnamon, and baking powder. Set aside. In a mixer, cream together the vegan butter and coconut sugar. Add the vanilla and mix well. Add the eggs, one at a time, mixing well in between. The batter will look messy, like it’s all broken, but that’s the way it’s supposed to be. Add the dry batter ingredients to the wet and mix just until blended and smooth. The batter will be thick. Gently fold in the blueberries until the batter is completely mixed in with the berries. Spread the batter evenly into the prepared pan and bake for 50 minutes, turning the pan halfway through at 25 minutes. The buckle will be golden and puffed and a toothpick inserted in the center will come out clean when it is done. Cool for ten minutes on a wire rack. Loosen the sides of the cake with a butter knife from the springform pan, and release and remove the side pan. Let the cake cool completely and enjoy!